Last regular episode is Monday, March 11 and ATFR is Tu esday, March 12. Has anyone watched the Young Once episode 1 season 2? I never watched the first season. I probably won't. But since I read both Caelan's statement and Cassie's, I decided to check it out. I couldn't watch the whole episode because I didn't want to sign up for a free trial of the Castle network. So I only saw the 13 minute portion they have up for non-members. Just watching a few minutes, there is no way Cassie comes across as not jerking Caelan around, drawing him back in needlessly to hurt him again. For me, she's an indecisive (putting it mildly) girl, who doesn't want to lose the great thing right in front of her but doesn't want to commit either because something better might come along (like a gig on another reality tv show called The Bachelor which could open up who knows how many other doors for her). Caelan seems like he is over her, but she keeps drawing him back in. So Cassie's statement is not what I see in that show. She's misrepresenting herself as having broken up with Caelan long ago, when there she is on the screen wondering if he's the one, not being sure, etc. IMO. If Colton watches it, I'm sure he would be a little disturbed because this was all just a few weeks before going on the Bachelor. IMO Caelan can do way better and he is a class act. Cassie?.. not so much, JMO. ETA: And it makes sense Caelan would post a statement AFTER watching her on Monday's episode, as well as after watching her ITMs on YO. And this is why he emphatically says they are not right for each other. To be clear, I have thought Colton's goal is fame in all this (not a fiance) and IMO he looked for and found the girl who has the same goal who will take this f$a$m$e journey with him. @SFoster wrote: Has anyone watched the Young Once episode 1 season 2? 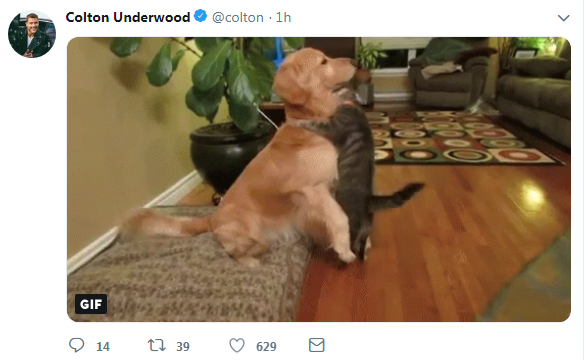 Was Colton always big on posting Dog & Cat gifs? Not just dog gifs... dogs interacting/cuddling with cats. @lavenderfan IA I mentioned that the other day when he tweeted that. I looked through his IG and did not see any cats. I binged watched the cassie parts on youtube of Season 1 and the way she comes across is pretty accurate to how she is in real life, just a little older. (I have met her a couple through a friend who is really good friends with her and her family and since I am a Bach fan I am loving my inside scoop!) I am watching the second season as it comes out, but I can tell you for sure that according to people who know both Cassie and her Ex, he was definitely the one who pursued the relationship pretty persistently. She wanted to stay friends but he wanted more and they fought about it a lot. Everyone was surprised when Season 2 happened since the first season was literally years earlier and I am guessing it was pretty awkward cuz my friend said they weren't on good speaking terms at the time and everything was kinda weird between them. The YO people are definitely timing everything very strategically with Bachelor to get more viewers so I am guessing they are "teasing" with previews that are edited to make people speculate and watch. She said Cassie isn't too worried what people will think if they watch since it will probably explain a lot. My personal feeling on it and especially after watching season 1, Cassie is prob too nice and had a hard time hurting someone who she cares about and is close to her family. My friend said its kinda a weird situation but that he kinda took advantage, thinking he could convince her to be with him, especially since her family really likes him. @GuardianAngel Right? I noticed today that Cassie mentioned wanting to foster kittens. For sure that's regarding to Cassie. ALSO, did anyone watch Colton and Cassie's IG today? Colton had a moment where he filmed himself listening to music in the car and drinking coffee, while zoomed in on his car's audio screen, and Cassie also had a similar IG in the car, and zoomed in on the music. @lavenderfan wrote: @GuardianAngel Right? I noticed today that Cassie mentioned wanting to foster kittens. For sure that's regarding to Cassie. I think they’re actually doing great. Remember just yesterday he posted the gif of the cat and dog cuddling. I wouldn’t look too much into the song he was listening to because he’s been tagging and following that singer for a while. I think they’re actually in a really good place. I just thought it was super adorable because colton’s Dog and cat interaction gifs are very very indicative of Cassie. Like... it’s too obvious. I mean last week after their one on one date aired, the gif he posted was the dog and cat eating each other’s Faces and then looking up as if caught. I’m not too worried about the two; shockingly I have a weird feeling that there is a very high chance that these two will work out to wedding bells. Just an inkling. I hope your weird feeling and confidence in their relationship is spot on. I really do. I wish I could say that I was feeling as confident as you . I keep thinking If she really did care for him (which it seems she did) why would she leave the show, She even said on her one on one that she knows Colton def cares alot about her. ( she's special, insanely attracted to her , blah blah ( If she just wasen't ready to accept an engagement ring I could understand and appreciate her keeping it real but to get cold feel an flee the show without discussing her feelings with the producers and with Colton away from the cameras ,I can't imagine why there wasen't another option for her. In the pass their were plane tickets, ring on a string, ect . I'm sure they could've done something to ease her nerves so there would be a Final Rose Ceremony. If my memory serves me well I don't recall anyone in the F3 leaving the show (they've been let go by the lead before a fantasy date or before the FRC but walking off the show at nearing the end I dont recall it ever happening. ) but I guess there's a first for everything Engaged or not and as stated by many of the couples ,these relationships don't start until the show is done airing and they are back to reality, & out in public. Dame, I guess Cassie didn't know had she accepted a proposal its possible that she would get to keep the Neil Lane sparkler. A nice donation to any charity.. jk Anyway I'm anxious to get to the ATFR to find out what the hell happened.